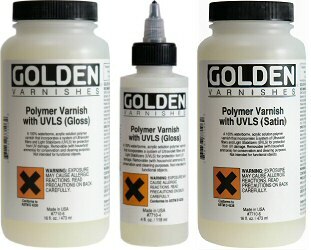 Golden Polymer Varnish with UVLS (Ultra Violet Light Stabilizers) is a water-based acrylic polymer varnish formulated to provide additional protection from ultraviolet radiation. This helps delay the inevitable fading that occurs in materials which may be fugitive in nature. Polymer Varnish is designed as a topcoat for acrylic paints and offers a removable protective surface to the relatively soft acrylic paint layer. It has a harder film than most acrylic paints, which diminishes the susceptibility of the surface to dust and dirt, and provides increased protection from scratching, marring and moisture. It has adequate flexibility to withstand normal handling conditions, including loose rolling. For interior use only. The product is not recommended for use on furniture or other surfaces subject to physical contact during use. Polymer Varnish remains soluble in alkaline solvents, such as ammonia. This means the varnish can be easily removed, taking with it any accumulated surface contamination without damaging the painting surface. The use of such a removable varnish provides a valuable tool to anyone trying to restore or clean a painting.